Harry Chapman was born on September 26, 1924, in Atlanta, Georgia. He enlisted in the Aviation Cadet Program of the U.S. Army Air Forces on November 28, 1942, and remained in Reserve status until he entered active duty for pilot training on February 1, 1943. He was commissioned a 2d Lt in the U.S. Army Air Forces and awarded his pilot wings on April 15, 1944, and then completed P-51 Mustang transition training from April to September 1944. His first assignment was as a P-51 pilot with the 375th Fighter Squadron of the 361st Fighter Group in England from September 1944 to October 1945, during which time he was credited with the destruction of 3 enemy aircraft in aerial combat, including a Messerschmitt Me 262 jet fighter. After returning to the United States, Lt Chapman completed jet aircraft training, and then served as a test pilot with the Air Proving Ground Command at Eglin Field, Florida, from August to December 1946. His next assignment was as an P-51 pilot with the 7th Fighter Squadron of the 49th Fighter Group at Chitose and then Misawa AB, Japan, from December 1946 to April 1949, followed jet instructor pilot school from April to July 1949. 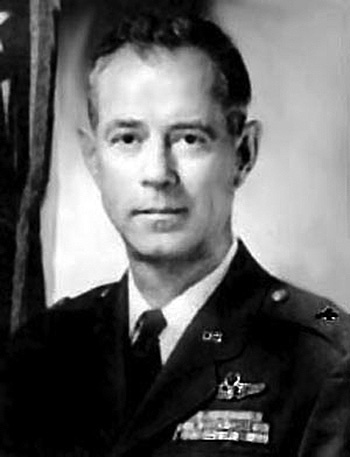 Capt Chapman served as a jet fighter instructor pilot with the 3525th Pilot Training Wing at Williams AFB, Arizona, from July 1949 to February 1954. During this time he also served as a demonstration pilot with the Air Force Acrojet acrobatic team, flying the F-80 Shooting Star. Maj Chapman next served as Commander of the 563rd Fighter Bomber Squadron at Clovis AFB, New Mexico, from February to August 1954, and then as Wing Inspector and Assistant Operations Officer of the 388th Fighter Bomber Wing at Etain AB, France, from August 1954 to November 1955. He served as Commander of Detachment 1 of the 388th Fighter Bomber Wing at Spangdahlem AB, West Germany, from November 1955 to August 1957, followed by Air Command and Staff College at Maxwell AFB, Alabama, from September 1957 to July 1958. Lt Col Chapman next served as Senior Air Force Representative to the U.S. Army Transportation School at Fort Eustis, Virginia, from July 1958 to April 1960, and then as a plans and programs officer in the Far East/Western Hemisphere Section in the Office of the Deputy Chief of Staff for Plans and Operations with Headquarters U.S. Air Force in the Pentagon from April 1960 to January 1964. He then received a Bootstrap assignment to complete his bachelor's degree at the University of Omaha from January to August 1964. His next assignment was as an operations staff officer, plans officer, Chief of the Concepts and Doctrine Division, and then as Chief of the Doctrine and Requirements Division with U.S. Strike Command at MacDill AFB, Florida, from August 1964 to December 1966. He then received an assignment to attend the Imperial Defense College in London, England, from December 1966 to December 1967, followed by service as Assistant Vice Commander and then Vice Commander of the 66th Tactical Reconnaissance Wing at RAF Upper Heyford, England, from December 1967 to June 1969. Col Chapman served as Commander of the 460th Tactical Reconnaissance Wing at Tan Son Nhut AB, South Vietnam, from June 1969 to May 1970, and then served as Deputy Assistant for Joint Matters in the Directorate of Plans with Headquarters U.S. Air Force in the Pentagon from June 1970 to December 1971. Gen Chapman next served as Assistant Director of Plans for Joint and National Security Council Matters with Headquarters U.S. Air Force from December 1971 to November 1972, followed by service as Chief of Staff of the Defense Intelligence Agency in Washington, D.C., from November 1972 to October 1973. His final assignment was as Deputy Director for Operations (Reconnaissance and Electronic Warfare) in the Organization of the Joint Chiefs of Staff at the Pentagon from October 1973 until his retirement from the Air Force on July 1, 1974. Harry Chapman died on March 20, 2013, and was buried at Arlington National Cemetery. Colonel Harry M. Chapman distinguished himself by extraordinary achievement while participating in aerial flight as an RF-4C Aircraft Commander in Southeast Asia on 19 December 1969. On that date, Colonel Chapman flew an unarmed reconnaissance mission over hostile territory to obtain vital photographic intelligence. Despite the adverse weather and extremely hostile environment, Colonel Chapman skillfully and aggressively obtained complete photographic coverage of the assigned target. The professional competence, aerial skill, and devotion to duty displayed by Colonel Chapman reflect great credit upon himself and the United States Air Force.